And here we were thinking they were broken up. Guess they reconciled without letting us know...lol. 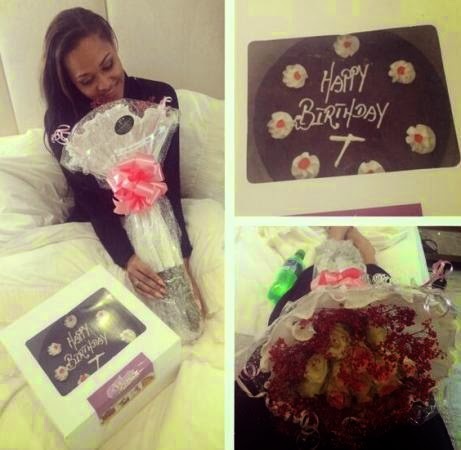 Anyway, today's Tania Omotayo's birthday and Wizkid not only gave her a shout-out on twitter but also sent her flowers and a cake although he's far away in LA. How sweet! Lin u get time oh! Snooping up on dis kids all d time.......next joor! Leave dem alone haba! And a bottle of sprite. You didn't mention that! Awwww! So sweet, good to see them back again. She's the right person for him. Good for them .. And people will be poknosing in other people's affair ..
Our own Rihanna and Chris Brown! babe am happy for you! kinda jealous doh! These omotayo sisters are hungry for fame... they just want to be seen! She is his ex nt his enemy. wizzy wizzy naso e suppose 2 b.
so wot?.....i guess i shuld jump up n shout. What if they are friends??? TO EACH HIS OWN! NEXT? Must you live your entire life online? Lmaooo for all you may care...they never even broke up ! They just wanted you lots to leave their behind. Even the weekend he said they have broken up..they went out together ! Cake n flowers only!!! Abeg they've broken up. Off and on relationship suggests they're not meant to be but force it because they don't want to find someone else. Better the old slippers you've always worn than the new ones that could pinch your toes or turn out to be the best purchase you've ever made. Lmao. Prostitution has assumed new dimensions in Nigeria. Wizkid, keep using her to cover up ur bisexual lifestyle. Did they ever split? Publicity stunt!!!!! Love em together tho. I'm so jealous. I hate you Tania. Wizkid there's God oo. Hw dt one take give me job?? Linda y u come carry last 4 dis 1...R they really back on, off or FWB...?? Anyway hbd to her. Make dem let us rest.Money when nor reach American Artist to take feed them Dog a Day if them spend am on their GF them now go let us here word again,HBD T.I rest my case. Was there any break up in the 1st place? Who cares? That na their problem. Happy b day tania.. tomorrow person go tell me say I no want Ferrari say na love I go chop. this is why you have to mind your business in issues of love As you have know they have reconcile, wish them well. star boi tin....keep it up bro! I wish to see them together .. He will always make her a surprise before he wants to prove d media wrong...my brother we know or tricks! U r no longer with DAT girl I knew dat. Wow! So sweet of u ayodeji,lindodo lindada wen re u us our own nau? Awwwww....now dis is lovelyyy....u cant escape 4rm love no matter hw hard u try..
Na only cake him buy, nonsense only 20k. Where the ferari and buggati for your babe now.cheap love. Ooh hw romatic,Hv fun babe is ur day. Wizy hope ur nt hurting d mother of ur son?Hbd Tina hv fun! Person wey dey nack babes in LA right now..
Small boy doing big boy tinz. HBD Lola. I guess the media and linda was left out of d reconciliation . Nice one. That's called maturity... they need not be reconciled before he does a thing like dat. keep up Wizzy! I love your perception, it helped to keep u 100 in that aspect of your life... Don't just be good, continue to be great. l dont care if them broke or mend... abeg neeext. Steve d libers pig! Hope u've washed that dirty boxers u always wear! I'll expose u! Ur happy and jealous? Same time? No naa.... U can kill! Tania run!!!!!!!!!!!!! Yes" the answer to ur question is NO"
Spoils??? With cake and Flower??? #BeefAlert#...Linda is only doin her job noni n someone is dere attackin her fr dat lol,weitin bring u com here?she break ur rlationship ni?#oloribooooooruku#!ehen Tania HBD sit down dere dey happy fr cake o! That's why he isn't with a girl like you. Miss Materialistic! It's Bieber and Gomez- no DV tales in this relationship. Wizkid instead of dropping ur album u there giving girls gifts Davido is winnig all the awards wizkid do u thing if fall today them girls are gonna be there for u? ?u.there in L.A photoshooting urself like a fashion designer biko..